The dust has finally settled, and Jeremy Lin is officially a Houston Rocket. When I wrote my last post, my emotions were running high -- I was upset with James Dolan, Daryl Morey, Jeremy Lin’s agent, Carmelo Anthony (for commenting), and Jeremy Lin himself. I am not going to call Jeremy Lin a traitor or say he wasn’t that good. Jeremy Lin is a great offensive player and clearly an above average NBA point guard. I have idolized him for 5 years now and even remember praying that he would make a summer league team and find his way onto an NBA roster. It was like a dream watching Lin versus John Wall part 1. I was upset when Golden State cut him, excited when Houston signed him, then upset again when he was cut again. I remember the moment I read that the Knicks had signed Lin and when he finally got solid minutes against the Rockets and Nets. Then there was Linsanity! We will never see something like it again; you can’t replicate the stage, the state of the Knicks, and how quickly it all happened. But as a Knicks fan, as painful as it may seem, it might have been the best situation for everyone involved. I am sure some New Yorkers and Houstonians will think my logic is ridiculous, but I am going to say it anyways. If worse comes to worst, another new rule can help the team out. The "stretch provision" allows a team to waive a player and extend his salary payments over twice the number of remaining seasons, plus one. So if Lin is waived with one season remaining on his contract, he would be paid his salary over three years. Here's the important part -- teams also may elect to stretch a waived player's salary-cap hit over the same number of years. So if Lin proves to be a disaster over the next two seasons, the Knicks can waive him, stretch the payment of his $14.8 million salary over three years, and reduce his salary-cap amount to about $4.9 million in each season. This would reduce the team's tax bill significantly. If the Knicks are right at the tax line, a $4.9 million salary would translate to a $7.35 million tax bill. This is much more palatable. If this was about money, the Knicks would have kept Jeremy Lin. MSG stock has already dropped over 100 million, and the TV money in China would be enormous. Jeremy Lin would be a money-making machine in New York. 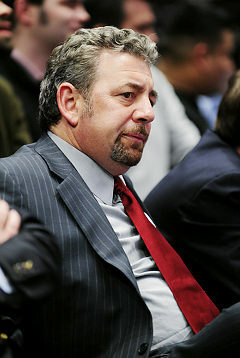 No, for James Dolan it was always about loyalty and feeling betrayed. Some say that the Knicks played their hand wrong by not setting the price for Lin, but Lin’s agent would have asked him to test the market regardless. I agree the Knicks should have never said they would match any offer. Reports say that the Knicks reassured Jeremy Lin they would match the first offer, not expecting Jeremy Lin to renegotiate the terms. Nevertheless, let us assume that the Knicks never opened their mouth, and they matched the 4 year $28.8 million contract. The Knicks would be set with a starting five of Lin, Shumpert, Carmelo, Amare, and Chandler. Knicks would have a bench of JR Smith, Novak, Camby, and Kidd. Although this team has potential, I don’t see championship potential. The New York Knicks are all-in, and when I say all-in, I am talking about trying to win a championship in the next three years. JR Smith just signed a $2.8 million contact. He clearly took less to stay with a contender, and I am sure he would be lying if he said he wasn’t jealous of Jeremy Lin’s new contract. As much as I want to believe that Melo and Amare loved playing second fiddle to Linsanity, let’s be real -- THEY HATED IT. Egos run this league, and the Knicks decided to try to win it all with Carmelo Anthony. Whether you like it or not, this team is going to go as far as Carmelo can take us. There are only maybe 10 players in the league that can be your best player and give you a shot at winning a championship. Melo is one of those players, and Jeremy Lin is not. Also the Knicks became hostages to Linsanity, and Woodson would have to start Jeremy Lin no matter how he was performing. Now the Knicks were able to get Raymond Felton at a bargain deal of $9 million over three years. Felton has never been the same since he left the New York Knicks; I remember being angry that they included him in a trade in the first place. Not only did Denver take Gallo and Wilson Chandler, they took the cute, cubby point guard that had started a budding friendship with our star power forward. Let’s take a closer look at the numbers between Felton vs Lin as the Knicks starter. Felton averaged 17.1 points, 9.0 assists, 3.3 turnovers, 3.6 rebounds, 1.8 steals, and a .423 field goal percentage over a 54 game period. Lin averaged 18.2 points, 7.7 assists, 4.7 turnovers, 3.7 rebounds, 2.0 steals, and a .445 field goal percentage over a 25 game period. Both players did well in the Mike D’Antoni system, so I will not put too much weight into that. The numbers do not lie -- Felton is the better value at 3 years $9 million versus what Lin got in 3 years $25 million. Also in the end it is not about value to the Knicks profit line but the value to the team's salary cap. Lastly Felton’s defense is a huge improvement over Jeremy Lin’s defense. Jeremy Lin can be a deserving All Star, but his defense resembles that of Steve Nash, and that is never a good thing. My last argument of why the Knicks ended up making the right basketball move is that a team with three defensive liabilities will never make it far in the playoffs. The Knicks need to follow the Dallas Mavericks model and have 3 solid to great defenders on the court at all times. Chandler is a great defender, and Iman is more than solid, but even the two of them could not make up the lack of defense from Amare, Melo , and yes, Jeremy Lin. The Knicks may never win it all, but I do believe they are closer today with Felton as their starter than they were yesterday. The Knicks also will have more financial flexibility to add pieces to their team as limited as it will be. Unless Jeremy Lin becomes Steve Nash in his prime, this looks like the right move was made since money was not the real motivation. Daryl Morey seems to be a hero in Houston, but I want to be clear in saying that if Morey was in Boston, New York, or Los Angeles he would have been fired a year or two ago. I get it, the guy is brilliant -- I am sure he is managing the team very well, and every year is profitable for Houston Rocket management. Moreyball (NBA’s version of Moneyball) can only take you so far. Most players in the NBA are overvalued, and every contender besides maybe the Spurs has overpaid at some point or another. With that being said, I believe the Rockets could easily turn things around if they get Dwight or Pau Gasol and one of these rookies turns into a stud scorer from the wing. As a Knick fan, I think Morey personally wanted Lin back to rectify his mistake of cutting him in the first place. 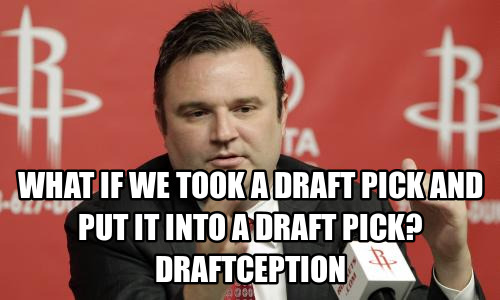 Daryl Morey is a man who prides himself in evaluating talent and even openly admitted his regret last season. I am sure when the Knicks came out saying they would match, Morey felt frustrated and thought he would go ahead and make it take much tougher on the Knicks. The time period of July 1st to July 11th is when teams can start talking to free agents but can't officially sign contracts. During this time period, it is expected that all verbal agreements and contracts remain as they are. It is more of a gentleman’s agreement; there are no rules that say you can’t change the term or retract the offer. I know the Toronto Raptors must wish they didn’t have to honor their verbal offer to Landry Fields of $20 million after missing out on Steve Nash, but that is neither here nor there. In the end, Morey may have changed the terms out of spite, since even up till yesterday night, Morey still thought the Knicks were going to match his offer of $25 million in guaranteed dollars. The truth is Morey has been around for about 5 years, and things seem to be holding steady with his team annually ending up in the 9th seed. Interest in the team last year was at an all-time low, and more Houston fans I know were more interested in how Jeremy Lin was doing than their Houston Rockets. Morey has finally decided to completely gut his team, and if no big trades take place, he should have put his team in a good position for a solid draft pick. In today’s NBA, this may be the only way to build a solid team that is also financially responsible. But Morey doesn’t want to lose fan base while he begins the full-on rebuilding project, and this is where Jeremy Lin fits in. Jeremy Lin will bring more attention to this franchise than any other player in the NBA. Once again the Houston Rockets will become the darlings of China. (Side note: I think now is the time to bring back the red and yellow jerseys for all home and away games.) By being China’s team once again, the Rockets will bring in more money than ever before and maybe finally give Morey the flexibility to create a championship level squad. This also gives Morey time to build through the draft, and he will likely have two picks in the lottery next year in addition to his three first-round picks this year. Throughout this whole process, I felt the most disappointed in Jeremy Lin. He never made his intentions clear, and as much as people want to blame the Knicks for not making an offer to start, Jeremy never said he really wanted to return to NY in the first place. His actions actually seem to tell an entirely different story if it's true that he took the Knicks guarantee back to Houston in order to get $5 million more in guarantee money. So the question I have here is this: what was Jeremy Lin’s motivation to go back to the table with the Houston Rockets? Was it because he was greedy and actually thought that Marc Stein tweet about the Knicks matching anything up to $1 billion was true? Or maybe the more likely scenario is that Jeremy Lin was worried that the Knicks would match and needed to get an offer that would make going to Houston possible. If this is the case, I wonder why Jeremy Lin was so desperate to leave the city that made him and gave him the opportunity of a life time. So many questions flood my mind when I think about this. Did Melo and Lin really not get along? Was there too much jealousy in the locker room over Linsanity? Was Lin afraid of the pressure and constant press of New York City? Or is Lin just like most basketball players in the NBA seeking more money and more shots? Only Jeremy Lin really knows, so I will leave it at that. If it was really for more money, then this whole situation really is "Linsatiate." In that case, Jeremy Lin gambled against Dolan and lost. My feeling is that greed wasn’t the main motivation. Jeremy Lin is already the most sought-after athlete for endorsing products to sell to the most affluent group in the USA (Asian Americans). He could have easily made millions more by staying in New York City. I think it comes down to Jeremy Lin genuinely wanting to leave the bright lights of New York City. As a current resident of NYC where I work and live (just moved into the city this month), I will agree that the Big Apple can be quite overwhelming at times. This is a city of comparison, pressure, and status. The media and residents aren’t always logical in their comments, and many seem to have an attitude of superiority. That being said I am sure teammate chemistry, Landry Fields leaving, and limited minutes and shots to develop his game all played a part. Take a bow -- last year was an amazing show! Do I think this is a smart move for Jeremy Lin? Of course not, but then again I am a Knick fan, so maybe you shouldn’t take my advice that seriously. I think Jeremy Lin could be so much more on the grand stage of New York City. Not because he would become a better basketball player, but he would have a larger platform to do what he was set on this earth to do: to spread the good news of Jesus Christ. Jeremy used his platform to perfection last season to share his faith and uncover the racism that Asian Americans (especially men) still face today. I also think Jeremy Lin undervalued the fact of being on a talented and competitive team. This could change for the Rockets over time, but right now the Rockets look more like a 2011 college team than a championship contender. In New York he had talent around him he could rely on; last year when Linsanity began to die down, the Novak show picked up and kept Jeremy Lin out of headlines for his large amount of turnovers. Now in Houston he will be like Brandon Jennings with the Bucks -- teams will be fully focused on Jeremy Lin and will throw pressure through double teams. It was just yesterday that Jennings was a future star after he dropped 50 points in one game his rookie season, but the league took notice, and there hasn’t been much to mention about Jennings since. I hope I am wrong, that Jeremy Lin will prevail and continue to be the pride and joy of every Asian American and underdog around the world. What makes me feel the saddest is that I have come to the conclusion that Jeremy Lin wanted out of the New York Circus, I mean, the New York Knicks. He decided to leave, so I have no right to be upset at the mad king James Dolan or at the wise GM Daryl Morey. This is what Jeremy Lin wanted, and doesn’t every man deserve that choice to choose where they want to work? I will always be thankful for what Jeremy Lin has given us over the years. He has given us the most exciting two weeks in sports, an Asian American to rally behind, and hope that anything and everything is possible through God. 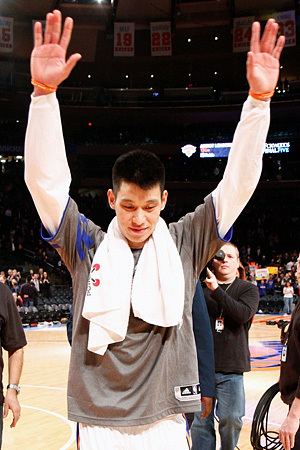 Jeremy Lin, you are still the Great Asian American Hope and always will be. Photos courtesy of Debby Wong/US Presswire, Getty Images, and NY Daily News. Jeremy Lin- "Honestly, I preferred New York," Lin said. "But my main goal in free agency was to go to a team that had plans for me and wanted me. I wanted to have fun playing basketball. ... Now I'm definitely relieved." In all honesty, by training camp, the Rockets will probably have just as much of a chance of a championship as the Knicks, although that's probably not saying that much. You're right, though, it came down to Jeremy Lin choosing Houston over New York. Also, we know not how God works, and plus, wherever he goes, the world's attention will be there. Caleb, do these comments mean you're retracting the "disappointment in Jeremy Lin" segment? If so, then I only offer one argument: that it doesn't make sense that a stat-focused guy like Morey would raise the offer "out of spite." He most likely raised it strictly out of his desire to ensure that the Knicks will not match, so that Lin would end up at the Rockets. No stat-guy throws out deals/offers just to mess with people. Unfortunately, moneyball should never allow a team to get good draft position, because even without luck, your team should be middle-of-the-pack, if not slightly better (considering you ran your stats right). So a full rebuild through drafting a superstar should be impossible for the Rockets (except for picks acquired through trades). Also, you can't gauge interest in the Houston Rockets solely through attention given to Jeremy Lin, because that was probably the case for ALL NBA teams at the time. All the Knicks away games during that period were bringing in huge numbers. I hope your right Mok, in the end I'm more concerned about the impact JLin has on people than his ability to win championships. I think the Knicks will do better than most, but I'm bias. There once was a time people called Dirk soft and was pathetic on defense, still going to believe Melo is too talented not to make a run. Trust in God, everything happens for a reason! Huanger- Not sure what to believe in the game of he said she said, but I mean even if the Rockets changed the offer Jeremy could have told them to change it back. Who really knows the truth of how it went down, guessing even the people involved are confused. I agree with your moneyball comment, thats why moneyball in its purest form won't work in the NBA where your top players matter so much more. Lastly yes, Jeremy Lin would increase popularity for all teams, just some need it more than others, I know for a fact Rocket tickets are pretty cheap and last few years barely sold out any games. He went for the money. He's 23, and he'll be 25 million dollars richer when he's 26. There's nothing wrong with that. Imagine yourself in the same situation...being offered a guaranteed 25 million dollars, it's a no brainer. It's not only for him, but for his family, his friends, relatives, his entire circle. Sure his overall worth may end up being greater than that if you consider endorsement and other business opportunities, but his fall can be just as fast as his rise. You just never know. I personally don't think the bright lights overwhelmed him. He was out with Iman, Landry, and Toney almost on a nightly basis. Again, he's 23 and he was living the life. Basketball is his day job, it's not the end all be all of his being. The more I think about it, the more I'm happy for him. Get it, son. Do work. Play ball, spread His word, and be an example for not only "Asian Americans" but to everyone around you. A couple tidbits from ESPN. 1. Lin had been given several assurances that he'd be back in New York prior to the Felton trade. In late June, the 23-year-old had dinner with Knicks coach Mike Woodson in Los Angeles to talk about his future with the club. "Woodson was saying, 'You're going to be a starter, you're going to be a big part of the team,'" Lin said. "I came away really excited." "Felton's signing was the first time when I thought, 'Oh, wow, I might not be a Knick,'" Lin added. 2. Lin tried to rejoin the Knicks during the playoffs, but wasn't able to play. He declared himself "85 percent" healthy before Game 5 of the Knicks-Heat series but did not suit up. According to a team source, that caused friction in the locker room. "Other guys were hurt, playing at less than 85 percent, so some of them didn't like that," said the source. Lin addressed the injury and the surrounding circumstances with Sports Illustrated. "Every single vet on our team that has been in the league longer than five years pulled me aside and told me that I shouldn't play," Lin said. "And I had arguments with them about why I should." Sports Illustrated also reports that Lin clarified his "85 percent" comment. According to the magazine, Lin claims that he was 15 percent from the "absolute minimum threshold to play." "People think it was easy for me to sit there and watch us lose, like I had nothing to do with the season," Lin said. "I was dying to play. I didn't miss a game due to injury in seven years until this past season, and people are acting like I wouldn't want to play in the playoffs? Of the NBA? In my first season?" Lin also said that Dolan, the Knicks owner, supported his decision. "I have plans for you in the future," Lin remembers Dolan saying, according to SI. "This is a long-term investment. Don't rush back." The Knicks being the Knicks. To be completely honest, most of the logic in this article combined with the last article make a lot of sense. You stated previously Dolan doesn't give a crap about money. He has more than enough money to burn which he has previously shown with a slew of bad signings. Therefore, making the argument that they didn't resign Lin because it would've cost them too much is pretty weak. The Knicks would've made back all their money Lin cost them and then some. It's not like they aren't already over the cap, it's not like they were trying to be fiscally responsible by resigning Novak, signing the corpse of Kidd, then bringing in Camby and Thomas. Wait were they being fiscally responsible last year when they picked up Chauncey's team option for 14 million then amnestied him before the season started (which I bet they could use on Amare now)? I know that fantasy has really skewed a player's value but you really think that trading for Felton was better for the Knicks than resigning Lin? Did you watch any Portland games last year, the only reason he was on the court was because Portland didn't have any other guards to play. He may have put up 'decent' stats but he played around 30min/g when he backup was Nolan Smith...Who the Eff is Nolan Smith. Most importantly, when has the "when motivated" argument ever worked out for players? How did that 'when motivated' argument work out for Vince Carter, TMAC, or Baron Davis for NY last year? Lastly for the Knicks, Dolan kept Isaiah for 3 years which was arguably and and comedically the worst tenure of a President in NBA history. You actually think the Knicks would have fired DM by now? Well, it wouldn't be Dolan's first idiotic move. DM has showed that he does not really make moves out of sentimental value. He has been willing to move any player he's drafted or cut ties with players he's brought in as long as he felt it improved the Rockets or gave the Rockets additional trading pieces. I highly doubt increasing Lin's salary in his third year was out of spite. Spite for what? He basically shafted the Knicks for more draft picks by trading them Camby, what does he have to be spiteful about? If you listened to any of the BS Report podcasts with DM, you would know that he is the first person to tell you that the Moneyball system used in baseball cannot be exactly replicated in the NBA. He's stated this multiple times on the Simmon's podcast. I don't know about other Rockets fans but I would take the capable, intelligent MIT grad over a tempermental, inept, entitled owner any day. This does not even need to be talked about. If Lin wanted to stay in NY he would be in NY, that's the dumbest thing I have ever heard. If NY wanted Lin in NY he would be in NY as well. Like Alby said, NY let him test the market, he did, got the best offer he could get for himself, and the Knicks decided not to match. If a company is going to offer you 5 million more a year you're going to say, "no thanks, 9 million is more than enough you keep that 5 million"? He did what any logical human being would do. This basically comes down to the Knicks pulling a Dolan and letting go of the best thing that happened to them last year. The more I think about it, the more I realize that the fundamental question is "who do you think is smarter: an Asian Harvard grad or James Dolan?" But yeah, I am not here to say Dolan made the right move, but I am trying to point out that Felton isn't just a scrub either, and that only time will tell. Felton had a bigger sample size and the Knicks won with him too. He never seemed ok mentally after he was traded, and was very upset he was include in the Denver trade. Also don't knock Baron Davis, that guy played his heart out for the Knicks last season or should I say Knee out (too soon?). The fact is no one is going to replicate Linsanity, not even Jeremy Lin himself. I think Lin is a much better player than Felton, but there is a big if with the Knicks. Lin is a better player when on a team that shares the ball and doesn't have so many players that demand shots to be effective. So its not that Felton is better, its just Felton will be ok with just being a role player and Lin is too big too good to be just that. can everyone restate everything that's been said here in a podcast? I just want to chime in with a thought: If Jeremy Lin plays in the summer league, the Rockets will be the first team ever to have the same starting 5 and rotation in the summer league and in the regular season. Oh and go ROYce White! We could combine Caleb's last 2 articles and rename it the "5 stages of grief"
TBH, Jeremy should play in SL. He only has 25 starts under his belt. Moneyball is back! Time for Moreyball to make an impact too.